Introduction: Benedict XVI and Conciliar Hermeneutics – Stephen M. Fields, S.J. On the Fourfold Sense of Scripture in Jesus of Nazareth, Volume 1 – Joseph W. Koterski, S.J. On the Christology of Jesus of Nazareth, Volume 1 – Joseph G. Mueller, S.J. On the Augustinian Roots of The Spirit of the Liturgy – Michael C. McCarthy, S.J. On Nature and Grace in Deus Caritas Est – Stephen M. Fields, S.J. 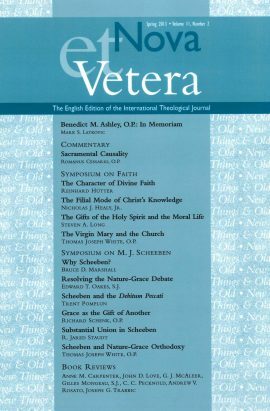 On Method, Nature and Grace in Caritas in Veritate – Vincent L. Strand, S.J. On the Continuity of Caritas in Veritate – Thomas Massaro, S.J. On the Political Order – Christopher M. Cullen, S.J. On Eschatology – Peter F. Ryan, S.J. On the Intermediate State of the Soul – John Gavin, S.J. Be the first to review “Nova et Vetera, Summer 2017 (Vol. 15, No. 3)” Click here to cancel reply.